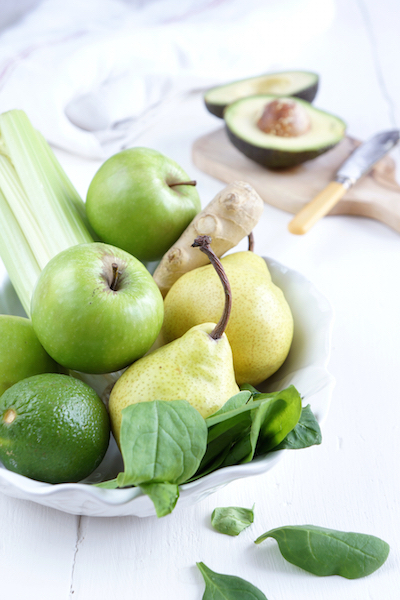 ‘The Goodness Green Smoothie’ could just help ease you back into the working year – its resplendent Greenness only hinting at the fact that it is great brain food! Potassium feeds your brain and lifts your mood! 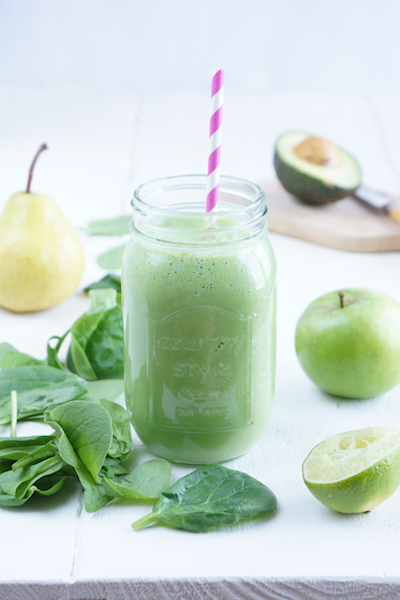 Avocado and spinach are a great source of potassium – key to both mental health and brain function. Potassium facilitates oxygen transfer in your delicate cranium, stimulating neural activity and increasing cognitive function. You will suddenly be able to focus in even the most tedious early morning meeting (and remember it better too… although that is not necessarily an advantage). Potassium deficiency results in both adverse mood swings and fatigue, as it affects the conversion of glucose to glycogen – an important form of long-term energy storage. Who would have thought that avocados are mood lifters?! Potassium levels tend to decrease during periods of: augmented alcohol intake, stress and an unbalanced diet (your average Christmas, in a nutshell)! Even though the avocado belongs to the fattiest group of plants on earth, it can actually help you loose weight when consumed in moderation. It’s high fibre content will keep you full, longer. 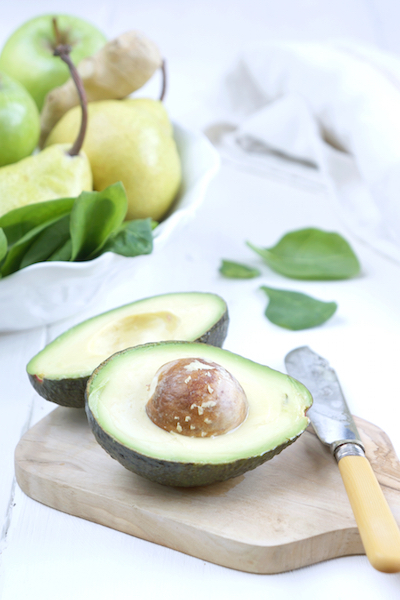 Half an avocado for lunch can reduce hunger pangs by 40% and can decrease your urge for all that disastrous snacking. In addition, it will help you to absorb the fat soluble vitamins: A, D, E and K.
Avocados are in fact berries. To test an avocados ripeness, for that perfect guacamole, you should take it in your palm and squeeze it gently, rather than bruising it with your fingers. Even if you discover, once you get home, that your ‘juicy avocado’ is as hard as a bullet, you can actually ripen it yourself by putting it in a brown paper bag with a banana or an apple (the joys of ethylene gas). For regular smoothie inspiration, connect with Françoise La Prune on Facebook or Instagram. Juice the pears, apples, celery heart and ginger. 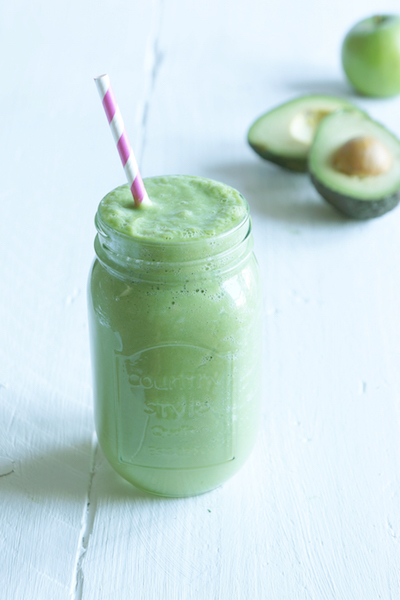 Pour the juice in the blender along with the avocado, spinach and lime. Blend. Add oats to your blender for a more filling & nutritious breakfast! For more antioxidant benefits top with goji berries and dried blueberries. You don’t have a juicer? 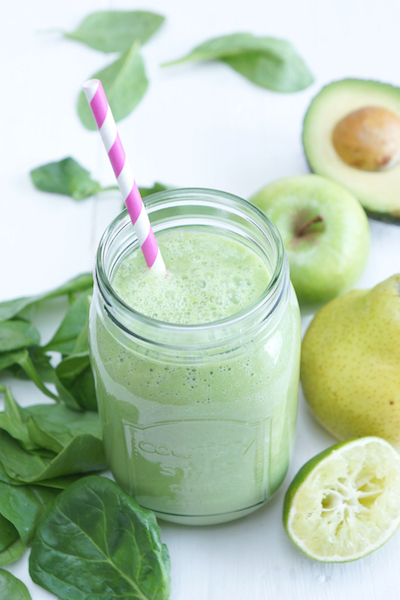 Just blend 1 pear, 1 apple, 1 celery stick, a bit of grated ginger, 1 avocado, a handful of spinach, the juice of 1/2 a lime and coconut water. 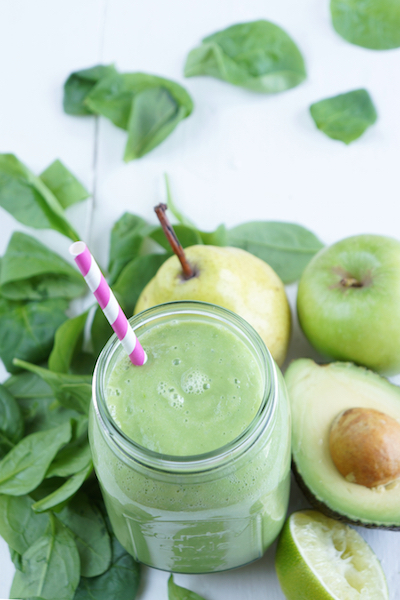 This will make you a fibre rich smoothie! livestrong.com; bembu; Organic Facts; Wikipedia; orthomolecular.org; healthiest foods; ideafit.com. White bowl; smoothie jar; pink straw; knife from Covent Garden Antique Market. This entry was posted in Food, Food Photography, Food Styling, Recipes and tagged breakfast, detox, juice, photography, raw, smoothie, vegan, vegetarian by Françoise La Prune. Bookmark the permalink.